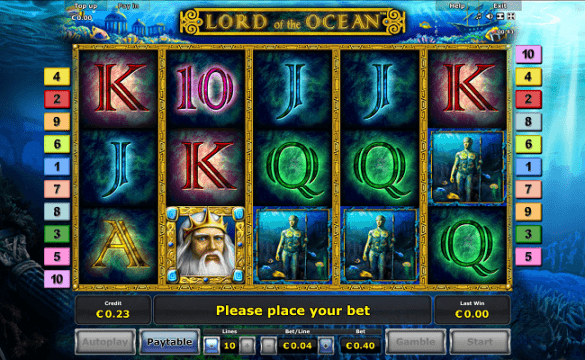 Lord of the Ocean is an online mobile slot game of 5 reels and 10 Paylines powered by Novomatic software platform. This slot is a bit like another slot game known as Book of Ra Deluxe. Lord of the Ocean mobile slot can be played using coin sizes 0.04 to 4 per spin, while minimum and maximum bet per line for the game is .040 to 40. You can win a maximum of 200,000 coins on your total bet while playing at this beautiful slot game presented by Novomatic platform. You can choose any of Novomatic online casinos to play this slot either for free or for real money. This slot includes features like free spin feature, bonus round, wild and scatter symbols. The graphics of this pretty slot game is simply awesome so is the background music. The reels of the game are being set against the backdrop of ocean. The wild symbol in this slot is the underwater wheel of fortune, which acts as the scatter symbol as well and it can replace all other symbols on the screen. If you hit 3 or more of the scatter symbols on active paylines you would trigger 10 free spins. The wild symbols as well as the scatter symbols in this slot game forms a great winning combination for the players. The slot also includes a “Gamble feature” which can be used after every win. You will have to guess the colour of the card and if you are right then you will win but if your prediction is wrong, you will lose your winnings.